Every day brings dozens of maemo-related posts via various channels, and keeping up-to-date with them requires a lot of time. 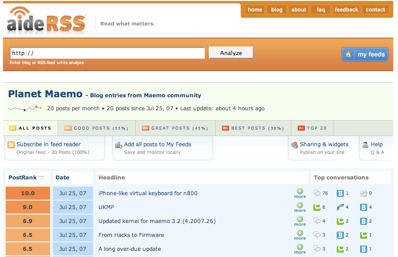 The new social news section aims to fix this by providing a somewhat Digg-like news aggregator that will bring only the most interesting items to the top. 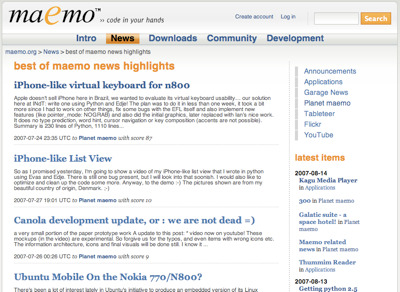 The way the new org.maemo.socialnews score calculator works is that it looks for number of votes or links from various sources, gives them configurable weight, and then builds a relevancy value out of that. This seems to work quite well, although I guess I will end up tuning it quite a bit when we start syndicating larger amounts of data. In any case, the next challenge is to combine the relevancy data of items and their tagging/categorization to build a newspaper-like page. Actually, feeding this data to a proper newspaper generator could make interesting results as well. 07 July 2008. 1 minute read.